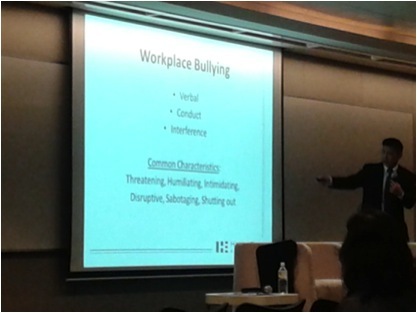 Tackling Workplace Harassments & Bullying When It Happens! The video of a supervisor named as Alan scolding and slapping an intern in office went viral and shocked Singaporeans, prompting condemnation from union leaders who urged the authorities to thoroughly investigate the case and take action against the supervisor. Before this video, horrible tales of harassments and bullying at workplace in Singapore have often been disregarded as urban legends. I have also heard of a low skilled worker Amelia (not her real name) who was verbally, emotionally, physically, and unlawfully abused for over 13 years in her job but she was so scared of losing her job that she chose to endure and keep mum. 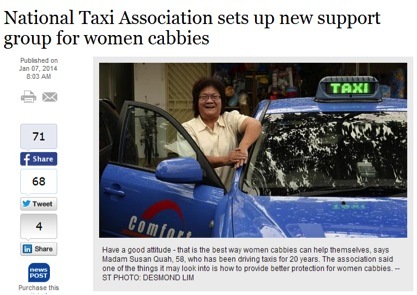 Even in Singapore which is supposed to be one of the safest cities in the world, female taxi drivers experience job hazards which includes harassment from unruly male customers. 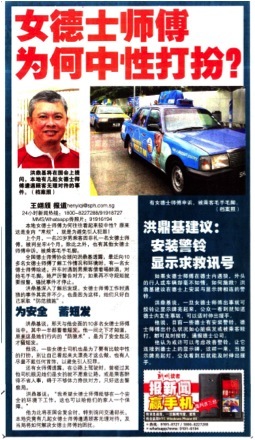 A newly-set up support group by the National Taxi Association aims to look into providing better protection for them. Such cases that actually got surfaced are probably just the tip of the iceberg, there are a lot more sufferings which never saw the light of the day. Workplace bullying happens when repeated, intentional behaviour are directed to a worker with the intention of degrading, humiliating, embarrassing, or otherwise undermining their performance. Bullying can take many forms, but essentially it is a form of harassment such as the continuing intimidation or belittling of an individual either verbally and/or physically. 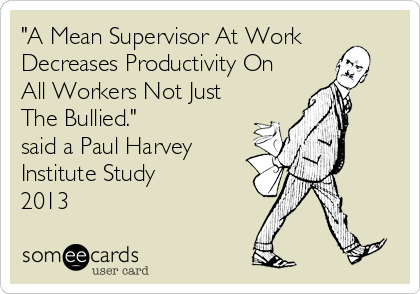 The source of bullying can come from employees, supervisors, or management, and is a real problem for workers at all levels. You will be surprised to know that bullying is not always top down, bosses too can be a victim of bullying. For example, a boss may be accused of harassing employees but the truth is that he or she was actually the victim of lies and gossip in the workplace. The workers in this case actually ganged up to force their superior out of the company. The sad thing however is that in Singapore, not many of us are not well versed in identifying workplace bullying and harassment when it happens. People may feel that certain treatment are justifiable or the same treatment is applied to everyone else in the organisation and not to them alone. You may not be aware that you are a victim! 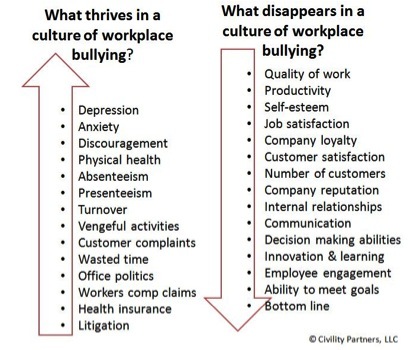 Hence it is important for us to learn how to recognise and address workplace bullying behaviour so that we can help to create a healthier, more productive environment for yourself and your colleagues. For employers, the presence of unnoticed workplace bullying has the direct impact on the company’s efficiency, productivity and profitability. Employees who are suffering under a tyrant will probably have poor morale, take frequent sick leave, be less committed at work and eventually leave the organisation. 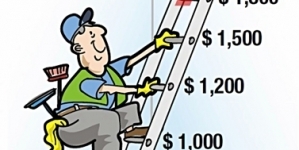 Employers will end up with increased cost from compensation claims, recruitments and re-training of new employees due to high turnover. Workers like us can suffer from extensive health problems including physical and psychological illnesses and injuries when exposed to workplace bullying. 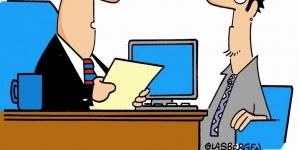 The reaction of individual employees will vary according to the nature of the bullying. Workers may experience stress, anxiety, sleep disturbance and impaired ability to make decisions. In the long run, depression and reduced quality of home and family life may kick in. For some serious cases, the affected worker might even consider suicide. Of course, the worker can always decide to leave the job but the impact does not stop there. Leaving a job due to workplace bullying can complicate job search as references may be hard to get and it can be difficult to explain the circumstances of quitting the previous employment during a job interview. Although Singapore does not have any legislation specifically covering workplace bullying, our government has made a stand when it comes to providing protection from harassment. A fine up to S$5,000, a jail term not exceeding 12 months or both may await those who engage in stalking, under a proposed legislation that seeks to make the behaviour a new offence under the law, Parliament heard on 3rd March 2014. The Bill states unlawful stalking as engaging in a course of conduct which causes harassment, alarm or distress to a victim; and the accused intends or ought to reasonably know that it would do so. 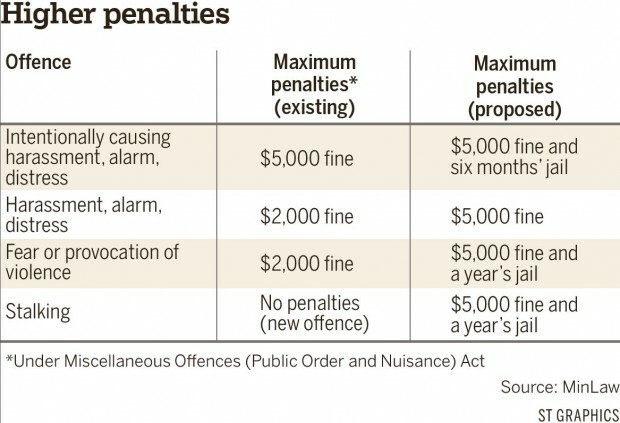 Subsequent offenders may meanwhile face a fine of up to S$10,000, a jail term not more than two years, or both. Examples of acts which are associated with stalking in the Bill include following a victim or a related person, attempting to make any communication by any means to the victim or a related person, loitering in any place, interfering with property in the possession of the victim or a related person, giving or sending material to the victim or a related person, and keeping the victim or related person under surveillance. Among other considerations in determining an offence under the Bill is that the court would regard the number of occasions on which acts related to stalking are carried out, the frequency and duration of the acts, the manner and circumstances in which they were carried out, and the likely effects of the course of conduct on the victim’s safety, health, reputation or economic position. 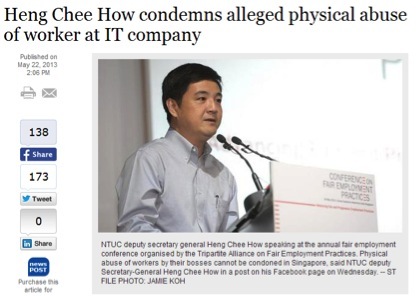 The workers’ union, NTUC, has also spoken out regarding workplace harassment. 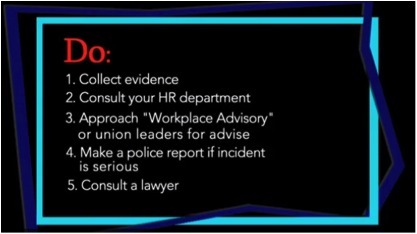 Patrick Tay, Director of NTUC Legal Services Department, shared what victims can do when faced with harassment. If you feel that you are picked on a disproportionate amount, it can be tempting to justify with excuses such as “Everyone gets treated this way,” or “I deserve it”. These are some of the common guilt trips that bullies try to lay on their victims. It is easy to fall into the trap of self-loathing if you feel you’re being bullied. You have to register the fact that you are a victim of workplace bullying and you need to do something about it. Of course, this is a lot more difficult than it sounds. However, you need to have a good talk with the bully in public spaces with co-workers around to let him or her know that you are frustrated and the bullying should stop. If the bully retaliates, resist the temptation to shouting counter insults or yelling back as it may get you in trouble or making the situation worse. Use a calm, collected tone of voice, tell the person to stop and just walk out to engage higher authority. You need the proof to go to the authorities so record specific times, dates, locations, and the names of any witnesses to the events. Gather as much information as you can as collecting documentation is the most concrete way to get the bullying to stop what he or she is doing. Talk to fellow colleagues every time you feel bullied and make sure they back you up. It will be a good idea to have them write it down for future reference. If bullying tends to happen at particular times or locations, have your witness linger in the area if you suspect you’re going to be tormented by your bully. Bring partners into a meeting with a superior who you feel bullies you. You’ll have backup in case things get ugly and you’ll have evidence for later. Tripartite Alliance for Fair Employment Practices (Tafep) advised that you can approach your supervisor, human resource department or union for advice and assistance. If you are a union member, you can also approach NTUC, which also has a Workplace Advisory app for advice on your workplace issues. However, if the bullying involves physical harm, the employee should consider making a police report. And if the bully is the supervisor as in the case of the intern, you may want to bring up the matter with someone more senior or approach the Ministry of Manpower (MOM) for advice and assistance. 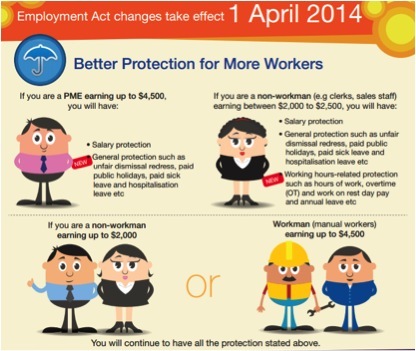 One last thing to note is the new Employment Act changes that will come into force 1 April 2014 which protects workers earning up to $4,500 against unfair dismissal, which could be a form of workplace bullying. If all Singaporeans take an active stand against workplace bullying and harassment, we can put a stop to future occurrences and make our working environment a better one for all. 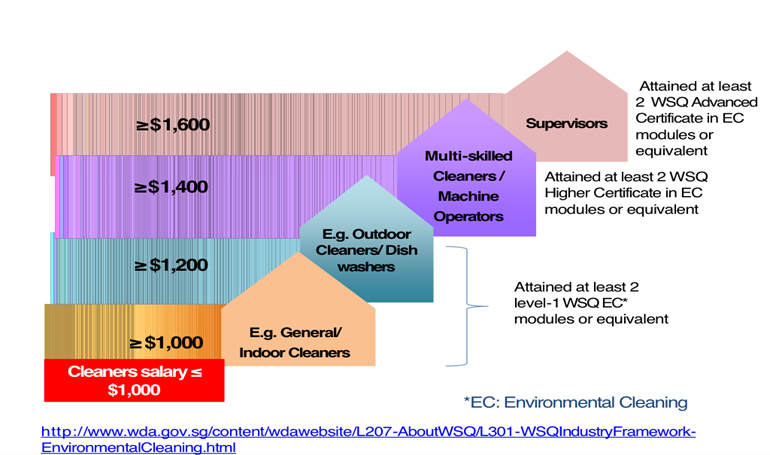 Will Fair Consideration Framework Create Better Jobs? This is very helpful thanks. I find this helpful for me.